Freegans are anti-consumerist individuals employ alternative living strategies based on “limited participation in the conventional economy and minimal consumption of resources. Amongst other they salvage discarded but unspoiled food that has passed its best by date, as a political statement not because they are poor or homeless. This seems a very weird and almost humourous concept, but this site used it to link to the major food wastage problem in the UK. “Redistribution schemes such as FareShare can help reduce the 1.6m tonnes coming from retailers. This UK charity offers tailored solutions to the food industry by taking companies’ surplus and waste and distributing the edible food through a community network of over 500 organisations that help disadvantaged people. This entry was posted in .Consumerism, 3F - Fascinating, Green / Sustainability, Waste and tagged food waste, food-crisis, Freegans, organic, UK on October 20, 2008 by admin. 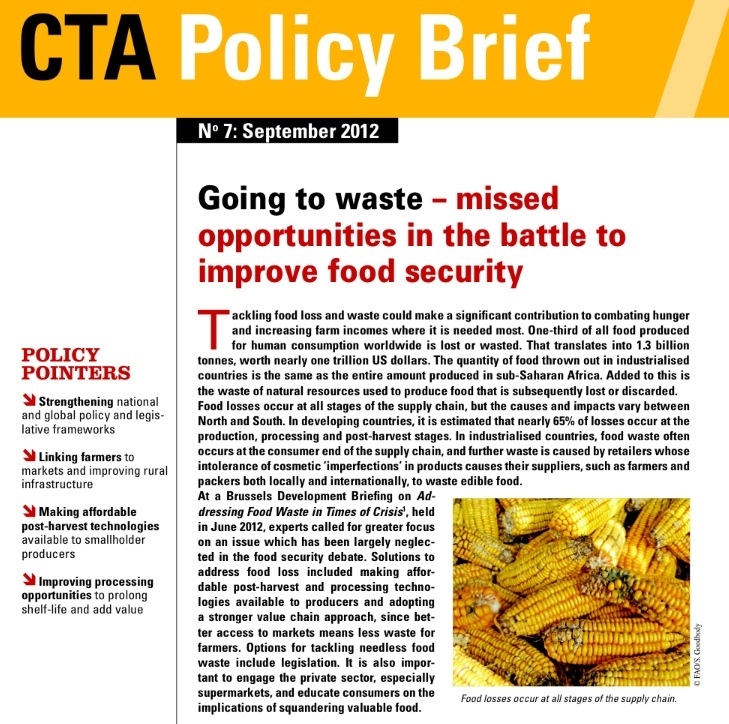 Energy and Food Waste are becoming major issues in Africa at present, with warning of dire consequences if the existing trends continue. One technology that sits at the intersection of these sectors is the treatment of processing waste using anaerobic digestion – or biogas. Biogas is a simple process that is used at household level by millions and is increasingly being used in Europe as part of the sustainable energy drive. Any organic waste can be fermented in simple ambient reactors over a long period, producing a combustible mixture of gasses consisting mainly of CO2 and Methane. Environmentally, burning Methane is beneficial because it has a hothouse effect some 14 times that of CO2 and is often naturally released by fermenting waste. The liquid remaining after fermentation is stable and not noxious, even if the waste fed to the process are eg human waste and can be used as a fertiliser. In household processes gas is used for direct heating and lighting, while in industrial applications is can generate electricity which can be sold to the grid. Ontario-based StormFisher Biogas is forming partnerships with North American food and drinks firms to allow it to use the organic by-products of farming and food processing operations to produce and sell renewable energy. “Food processors typically send their by-products to landfills or compost sites. Since we are able to extract more value from these by-products by using the energy they create, we are able to charge a lower disposal fee than landfill and compost sites”. 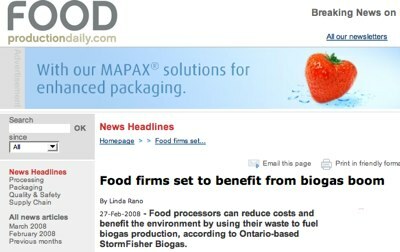 This entry was posted in Biofuels, Food Processing and tagged biogas, carbon footpring, Energy, food waste, methane, organic waste on April 16, 2008 by admin.